Last month I was not allowed to sing for two entire weeks. 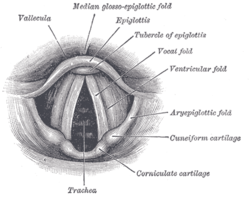 The vocal folds. Note the resemblance to some sort of terrifying H.R. Giger illustration of alien genitalia. I blame Adele. Late last year she was infamously put out of commission due to surgery to remove a polyp on her vocal cord that had hemorrhaged. Symptoms can include a hoarse-sounding voice, vocal fatigue, or a reduction in range. I don’t sing as well as Adele, but I’m willing to bet I sing just as much, between my three bands and various elevator serenades. After several years of peak vocals that were rangy and in-tune, for the past few months my voice just felt sore. I didn’t know how else to explain it. It didn’t come simply from being loud, or even just from singing. It was tired, and singing around the pain was starting to sound bad. My highs and lows weren’t as strong, and I was not as in-tune on harmonies. Thus, a trip to my ENT, which resulted in such fun escapades as sticking a camera down my nose to watch my vocal cords while I sang. The camera revealed not nodes or polyps (hooray! ), but a massive bruise on my left vocal cord. It honestly looked like someone had punched it! And, well, I had been punching it a lot – at rehearsals, in meetings, and screaming at the Garbage concert. Still, it wasn’t nodes or polyps (hooray! ), so I would not need any surgery. Probably. It depended on the nature of the bruise – which was the kind of thing that could lead to nodes (boo!). This is a set of vocal cords that look sortof like mine, except they have a cyst. But, let’s be honest – the cyst is hardly the most terrifying part of this photo. What I did need was vocal rest. “Tell me about your bands’ schedules,” my doctor asked me. I thought she wanted to come out to a show, but really she was trying to find a window for me to keep my mouth shut for over a week – ideally two. Luckily, this was the week prior to the #140Conf, which would preempt some of my standard rehearsals. Simply tacking a few extra days onto my break would get me through two weeks so we could follow-up. I walked out of the appointment with a smile on my face. No surgery for nodes (hooray! ), a set of custom-molded ear-plugs that would let my voice ring through, and two weeks of doctor-prescribed quiet time. It all sounded rather glamorous. At least, it did up until my first conference call that afternoon. I was shouting across the room at the tiny speaker in the phone on my director’s desk. I caught myself absent-mindedly pressing a hand to my chest – a sure sign that my voice was aching. I quietly stood up and moved several seats closer to the phone. The next day E and I were driving somewhere with Garbage’s “Automatic Systematic Habit” blasting on the speakers. I joined Shirley for her pre-chorus harmony and E shushed me from the driver’s seat. “No singing,” she said. The irony of the song’s title was not lost on me. I turned away from her to stare out of the window. It wasn’t just a matter of missing rehearsals. I had to intentionally lose my voice – treat it as if I couldn’t project beyond quiet, indoor tone. My two week rest pressed on. I had to contain myself at author’s club, unable to joust loudly with my peers. I stopped singing people’s names in hello every day at the office. I could not venture inside the VIP event that Nan and I staffed at the #140Conf – it was too loud. See, it turned out just fine for Adele. My glamorous two weeks of vocal rest sucked. My life without the full power of my voice sucked, too. Our voice is one of the things that lets us know we’re real and alive – instant feedback that we really exist. At least I could still talk at a normal volume! I thought about Adele and her months of silence, and Julie Andrews and her ruined singing voice. It could be much worse. I caught the problem early. My return visit to the doctor and her nose-camera was all good news. The bruise was almost gone, and my cords generally looked healthier and springier than before. But there were ramifications. It was clear that my speaking was stressing me out as much (or more?) than my singing. I needed speech therapy, different allergy medication, less of certain foods, and other tweaks to my daily life. Tonight will be my first time fronting the full, electric version of Arcati Crisis since this whole ordeal began. I’m excited and a more than a little nervous. Will I sound okay? Will the ache return? Will I have all my typical low and high notes – the four octaves of D I need to get through an AC set? Only time will tell. The answer I do have now is something was wrong with my voice. It could have been much worse, and if I hadn’t intervened it could have grown much worse. The morals of this story? Listen to your body. 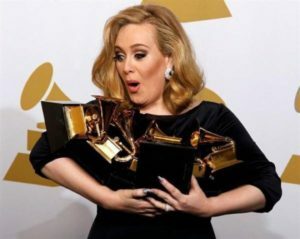 Adele was maybe singing a little too much and a little too loudly. And appreciate your health for every day you have it. Previous Post: « Does the past matter after a reboot? The number one cause of vocal problems in young singers is lack of adequate vocal warm-up and agility exercises. It’s like a runner deciding to skip stretching. Also, those guilty of not singing from the diaphragm to increase volume put tremendous strain on their poor voices.